Tonight was the Shop the Block in Reading and I stopped by to check out the festivities. I went to The Wine Shop of Reading, one of my favorite local wine stores. The store was packed with plenty of new wines. I was pleased to see that they currently have 9-10 different Portuguese wines. All of the shelves are full and this is the time to check out their new selection. They also have some new gourmet food items. There were plenty of people in the store this evening. If you want to see the store, but not leave your house, then maybe you should watch TV Diner this weekend. Or maybe next weekend, depending on their schedule. TV Diner is doing a special on Reading and the Wine Shop was one of their stops. They should have some cheeses and other nibbles as well. The Wine Shop will be also be open on Sundays, from 12-5pm, through New Year's Eve. I generally prefer the more unusual white wines, those made from less common white grapes like Chardonnay and Pinot Grigio. There are so many different white varietals available around the world. I have found some very interesting indigenous white varietals from countries like Greece, Spain and Italy. I recommend that you too try some of these different varietals. One such wine that I can recommend is the 2004 Argiolas Costamolino Vermentino di Sardegna ($10). This wine is from the Italian island of Sardinia. It is made from 90% Vermentino and 10% other Sardinian grapes. It has an alcohol content of 13.5%. It saw no oak and had partial malolactic fermentation. I found this wine to be a bright yellow in color with an interesting nose of tropical fruits. On the palate, it is crisp and has delicious flavors of citrus and tropical fruits. It has a nice balance and is very pleasing to the tongue. I had this wine with lobster ravioli topped with a cheesy vodka sauce. It went well, its acidity pairing well with the dish. At its price, this is an excellent value and well worth buying. If you want to try something different, buy this wine. This wine, for several vintages has received very positive press. For example, Robert Parker said: "The 2004 Vermentino Costamolino (perhaps the finest Vermentino I have ever tasted) exhibits ripe, exotic fruit (banana, pear, mango, and lemons) and salty sea breeze-like notes. With a delicious texture as well as a dry, heady finish, it will provide plenty of pleasure over the next 12 months. Score: 90." Are you free tomorrow night? If so, maybe you want to check out Reading’s 5th Annual Shop the Block. On Thursday night, November 29, from 5 to 9 p.m., the festivities will be held. A number of local merchants will be open with special sales, raffles and more. The stores include The Wine Shop of Reading, The Chocolate Truffle, Simms Jewelers, Goodhearts Children’s Shop, Sense of Wonder, The Hitching Post, and Everything but the Dog. These stores are all within a short walk of each other. Each of these stores will have a special Gift Basket up for raffle, and proceeds go to a local charity. This year, the charity is Reading’s Adopt-a-Family Program. Besides the shopping, there will be entertainment from student performers of Creative Arts for Kids and Reading Memorial High School as well as musicians from the Reading Community Singers. I usually attend, especially to pop by one of my favorite wine stores, The Wine Shop of Reading. I keep trying to win their gift basket but have not won yet. They usually have something available for tasting as well. Maybe I will see you there! The Winecellar of Silene will be holding a Winterfest Gala Wine Tasting this Saturday, December 1, from 1pm-4pm. "It’s that time of year again, time for our annual Champagne, sparkling wine, and other goodies tasting that we call WinterFest. We’ll feature over thirty wines, including such Champagnes as Krug Grande Cuvée, Taittinger Compte de Champagne, and Gosset Reserve. There will also be a selection of sparkling wines from Alsace, California and Italy, as well as interesting still wines from France, California, Spain, Italy, and elsewhere. This is our kickoff of the holiday season so join us here at the Winecellar." Wine is not the only alcoholic beverage I enjoy. Vodka is my favorite of the hard liquors and Chopin Vodka is one of my favorite premium vodkas. I enjoy it straight over ice, nicely chilled. I am also particular to Stoli Elit. In the last few years, we have seen a proliferation of new premium vodkas on the market. And the price keeps creeping up with each new product. I just read an article in the International Herald Tribune about what might be the most expensive vodka ever. And it is produced by the same company, Polmos Siedlce, that makes Chopin. Diaka, is a new rye-based vodka created using a patented diamond filtration process. "Diaka" is an acronym for "diamond" and "vodka." This new vodka is supposed to be available next year and it will retail for around $100 a bottle. The bottle will have Swarovzki crystals on it. There will also be a few crystals at the bottom of the inside of the bottle. The packaging is kind of gimmicky and adds to the price. I would rather a cheaper, plainer bottle. The patented filtration process uses almost 100 diamonds, some as large as 1 carat. The diamonds are kept in special tubing where the vodka passes through. With centrifugal action, the diamonds move through the tubing and supposedly cut the vodka molecules. After that, the vodka passes through a comb filter covered by diamond flecks. The end result is that vodka is supposed to be very smooth and clear. Would this really work? I don't know enough about the science involved to say one way or another. It does though seem very strange. Can you really cut vodka molecules? I certainly would want to taste this vodka before I would spend $100 on a bottle. With Stoli Elit costing around $60-65, then the Diaka is not that far off. But will it pass a taste test? Does it filtration process actually make a smoother vodka? Time will tell. Two months ago, I posted about "Who Buys & Drinks More Wine, Men or Women?" A recent report had indicated that women purchased and drank 60% of the wine in the U.S. Now comes a new report that the numbers may even be higher. The Napa Valley Register reports that at a recent Women in Wine symposium at Copia it was stated that women buy 80% of the wine in the country. It was also stated that many men are introduced to wine by women. The article does not state the source for these figures so I don't know how accurate it is. The number is certainly surprising. The article does not state anything about the type and price of the wines they purchase. I could believe the previous 60% but 80% seems quite high. The symposium was pushing that women are a strong power base in the wine world. There is also mention that biologically, women have extra tastebuds. This could explain why women's wine reviews differ from that of men. I don't know if their reviews actually differ that much or not. But it might be interesting to compare reviews from fellow wine bloggers, men and women, on the same wines to see if their reviews differ, and if so, how. There are certainly a good number of female wine bloggers now so it would be easy to do. The easiest comparison might actually be with Ryan and Gabriella of Catavino. They taste many of the same wines so it would easy to draw comparisons based on their tasting notes. I am still on a Portuguese kick, exploring the wines of this country, seeking other excellent wines. While at the new Spirited Gourmet wine store in Belmont this weekend, I bought a couple Portuguese wines. I knew nothing about these wines beyond what I read on their labels. And in fact, I could not even read the back label of one of the wines because it was written in Portuguese. But I was willing to give them a try anyways. I opened one last night, the 2004 Filipa Pato Ensaios ($25), the wine with the back label in Portuguese. Filipa Pato, the winemaker, is the daughter of famed winemaker Luis Pato. In 2001, after working at some foreign wineries, Filipa returned to Portugal to make her own wines. She settled in the Beiras region, which is a larger region encompassing Dão and Bairrada. Filipa seems involved in much experimentation in wine production so she chose to call her first wines "ensaios" which is Portuguese for "experiments." But, she is also a traditionalist in a number of ways. Thus, she works exclusively with indigenous Portuguese varietals. She also ferment and matures her red wines in oak vats, though she is doing some experimentation with the use of chestnut. Filipa Pato certainly seems to be an interesting winemaker. If the 2004 Filipa Pato Ensaios is indicative of her skill, then I will avidly seek out her other wines as well. The wine is a red blend of Jaen (60%), Tinta Roriz (20%) and Baga (20%). The Jaen and Roriz came from the Dao region and the Baga from the Bairrada. It used to be traditional to blend grapes from these two regions. The average age of the vines is 30 years old and it has an alcohol content of 13%. The wine was fermented in a stainless steel tank and 50% matured in used barrels and 50% in stainless steel. Jaen is the second most planted grape in the Dao region, after Baga, and is thought to be related to the Spanish Mencia. Tinta Roriz is a Portguese term for Tempranillo. Baga is a highly tannic grape found in the Bairrada, Dao and Ribatejo regions. I found this to be a dark red wine with a nose of black cherry. As soon as you take a taste, you are overwhelmed by its juiciness. It is like biting into a ripe plum. It has luscious notes of plum, black cherry and raspberry. The finish has some mild tannins and a bit of spice. It also lingers in your mouth for quite a decent amount of time. The wine is well balanced and has good structure. Its juiciness is very appealing. I would definitely recommend this as a Drink & Buy. It is an interesting wine with lots of excellent flavor. Another fine wine from Portugal. I will be seeking more wines from this winemaker. My new column of "A Passionate Foodie" can be found in the November 28 issue of the Stoneham Sun newspaper. This is a weekly column that concentrates on reviews of local restaurants though it may also touch on a few other food and wine topics. The new column will be published tomorrow and is currently available online. The new column is a review of Rang Indian Bistro, a delicious Indian restaurant in Stoneham. Drop by for some Vindaloo and Naan. Yes, it sounds strange for me to be telling you not to buy wine. But I have a very good reason so please just read on. The time of Giving Thanks has now passed and we now move onto a time for plain Giving. This December, many of us will give gifts and presents to our friends and family. It will be a joyous time of celebration. I love this season! The holidays elate me and it is so great to spend time with those I care about. Yet it is not a joyous time for all. There are people less fortunate for whom the holidays are a time of sadness. There are children who won't receive any gifts. There are people who will spend the holidays alone. There are people who will have to spend the holidays in hospitals or other health care facilities. There are people who cannot even afford to eat. Let us try to bring some joy to the less fortunate. Let us share our own joy with them. And that is the rationale behind why I have asked you not to buy wine. This season, when you want to buy a bottle of wine, don't. Instead, give the money you would have spend on that wine to the charity of your choice. Give a gift to those who truly need it. This won't solve all the problems of the world, but it will make a difference. It will help someone. And it will make you happier knowing the difference you have made. I would like to know everyone who participates in this, who is willing to help make a difference. All you have to do is add a comment here and tell me what charity you gave to. There is no need to tell the amount. Just tell me where you made a difference. Together we can make this a better world. The Vineyard will be holding a special Holiday Wine Tasting this Saturday, December 1, from 5-8 pm. There will be 40-50 wines selected especially for the holidays, including some great Cabernets, Bordeaux, Sparklers and '05 Burgundies. They do have special gourmet foods, including cheeses, so you can also stock up on some things for the holidays. After my recent positive experiences at the Grand Portuguese Wine Tasting, I have bought several Portuguese wines. I have been willing to give them a try, to see what I might find. This evening, with my dinner of veal chops, I opened a bottle of 2004 Casal Branco Terra de Lobos. The Quinta do Casal Branco Estate extends back to 1775. It is located on the left bank of the Tagus River in the Almeirim-Portugal, and has been owned by the same family for more than two centuries. Not only do they make wine, but they also raises horses. Their vineyards were planted in what was until the 17th century one of the largest royal falcon hunting grounds in Portugal. Thus, some of their wines are called "Falcoaria" which is the Portuguese word for "falconry." Their vineyards are predominantly planeted with indigenous varietals such as Fernão Pires, Trincadeira, Castelão, and Touriga Nacional. They do have some nonindigenous varietals as well including Cabernet Sauvignon, Merlot, Petit Verdot, Alicante and Syrah. The 2004 Casal Branco Terra de Lobos ($10), from the Ribatejano region, is a blend of Castelão and Cabernet Sauvignon. It has an alcohol content of 13.5%. This wine is a light red color with a nose of violets. It has some cherry flavors as well a bit of spice. It is an easy drinking wine with a bit of tannins. I enjoyed this wine but it did not impress me. After tasting so many other excellent Portuguese wines lately, including a number under $10, this wine just did not compete. As a $10 wine, it is good and is worth the price. But there are better Portuguese wines at this price. While walking around Harvard Square, near dinner time, we decided to stop and check out Wagamama. The restaurant is modeled after Japanese ramen bars. Wagamama is a chain that first opened in London in 1982. Since then, the chain has exploded and there are over 75 restaurants in 10 countries. Two Wagamama restaurants have recently opened in the U.S., one in Fanueil Hall and the other in Harvard Square. This is definitely a casual restaurant. There are long tables where about 14 people can sit. There is also a long counter at the front window where you can sit as well. The kitchen is open and you can watch them cooking if you wish. The drink menu has fresh fruit juices, waters, sodas, green tea, ginger peach iced tea, beer, sake and wine. The wine list is small and nothing is really exciting. They also only have hot sake. Where is the chilled sake? Green tea is complimentary with your meal and I did have some. It was hot and tasty, a very good tea. I also had the ginger peach iced tea, fresh brewed and unsweetened. That was delicious and refreshing. The flavors were subtle and went well together. They also good free refills on the iced tea. Well worth ordering. The food menu has Side Dishes, which they do not call Appetizers but that is really what they area. The Sides include such items as Gyoza, Edamame, Yakitori and Miso Soup. I had the Tori Kara Age ($5.25), fried chicken pieces with a chili, garlic and soy sauce. There were very good, meaty pieces of meat with an excellent sauce. There was a good portion of chicken as well. The entrees include Ramen bowls, Teppan fried noodles dishes, Rice dishes, Salads, Kare Noodle soups, and Chili Noodle dishes. Prices range from $8.50-$13.75. All of the food is made to order. Thus, you often can ask for a dish without certain ingredients. I think that is a big plus. We had two entrees, the Chicken Kare Lomen ($11.75) and the Ata-Taka Chicken Salad ($9.95). The Lomen is a spicy, coconut flavored soup with pieces of chicken. I got it without the bean sprouts and cucumber. This was a medium-sized bowl with a thick and very spicy broth, lots of ramen noodles and a number of thin chicken cutlet pieces. I very much enjoyed the taste of this dish. The Salad had thin chicken strips with bean sprouts and red onion atop baby spinach leaves and covered by their house dressing. This was another tasty dish. The only problem with both dishes is that they seemed a bit overpriced for the portion size. Another problem with the restaurant is that the dishes comes out when they are ready, and not in any order. You may get your entrees before your sides. On my visit, one entree came out first. Then the side dish. The second entree did not come out until about three-quarters of my entree were gone. I really think they should change this and try to time it so the entrees all come out at about the same time. Service was good, and the waitresses seemed to work as a team at the tables. Overall, I can only recommend this restaurant with qualifiers. The food is very good and there is a diverse selection available. But, the prices are a bit high and the staggered service of the dishes can be annoying. As I mentioned in my prior post, Belmont was once a dry town but has recently changed. Belmont granted permission to The Spirited Gourmet to open a wine store and they had their Grand Opening today. The Spirited Gourmet has their original store in Winchester and the new store shares some similarities. This new store is easy to find, not too far off Route 60. There is parking available on the street. As they are new, it looks like they still have not added a sign outside the store but I am sure it will come soon. You can tell from the outside though that this store is larger than the Winchester one. Inside, you definitely notice that this store is larger than Winchester. It is also has an excellent decor, with dark wood wine racks. It is quite an appealing looking store, very professional. There are some empty racks as they still are stocking the store. There is a very good selection of wine available and many more wines are on the way. You can find wines from all the usual wine regions, as well as some much less common regions, including Lebanon, Georgia (not the U.S. state), Hungary, and Israel. Few wine stores have wines from some of those less common regions. I should note that they even had 9 different Portuguese wines and I bought two of them. Prices are average and on line with the Winchester store. But, you should be able to find some more higher-end wines in Belmont. There are plenty of inexpensive wines there too, but there will be a greater selection of expensive wines too. On the right side of the store they have a refrigerator case for beers and chilled wines, as well as a case for hard liquors. There are also several cases for gourmet foods. Some of these foods are similar to the ones available in Winchester while others appear new to this store. There is some gourmet food available in other parts of the store as well, including frozen appetizers. I did pick up a few interesting items including an all-natural Vodka pasta sauce, some Cabernet Sauvignon-flavored linguine, and a couple small bags of Gouda flavored popcorn. As in the Winchester store, they also have a large cheese counter with a wide variety of cheeses from all over the world. It is a very enticing counter, especially if you are like me and greatly enjoy cheese. For the Grand Opening, they had a free tasting of about thirteen wines. Nick Cobb of Vineyard Road Imports (shown above) presided over the tasting. Nick is very personable and passionate about wine. 2006 Prendo Pinot Grigio, Italy ($12.99): Though I am not usually a fan of Pinot Grigio, I did enjoy this one. It was crisp, mild and had some interesting apple flavors. A good value at this price. 2005 Bouley Volnay "Clos de la Cave", France ($44.99): Yes, this is not a cheap wine but it is a very serious wine. This Burgundy comes from an excellent vintage and is a powerful wine with dark berry flavors and lots of spice, especially a bit of cinnamon on its long finish. It seems a bit harsh but I think it simply needs some aging. I think this wine has a lot of potential. 2005 Domaine de Duerre Vinsobres, France ($22.99): This is a Rhone style wine, a blend of Grenache, Syrah and Mourvedre. This was a light wine with strong mineral notes, strawberry and almost floral flavors. I was surprised as I expected a heartier, spicier wine. It definitely was intriguing and something worth checking out. 2005 Rosenblum Zinfandel, Maggie's Reserve, California ($49.99): This is a big, muscular wine with lots of spice. This certainly is a wine for a thick steak or large roast. It has lots of complexity and a long finish. It is well balanced and worth its price. There will be regular wine tastings at this store although the schedule has not yet been posted. There may be separate beer tastings as well. All of the wines at these tastings will be discounted 20%. I was impressed with this new wine store. It is a large and attractive store, with an excellent selection of wines, beers and gourmet foods. This is the type of place that is worth a drive to check their selection. I will definitely be returning there and probably will even lead a group of the North Shore Winers to one of their future tastings. It seems that dry towns are starting to vanish. Two previously dry towns (or at least without liquor/wine stores), Arlington and Belmont, have both decided to allow such stores to exist. I visited two of those stores today. Menotomy Beer & Wine is the first wine and beer store in Arlington. They do not sell hard liquor. "Menotomy" was the original name for Arlington, back when it was first settled in 1635. "Menotomy" is also an Algonquian word meaning "swift running water." It is a small store with some very common wines, such as Yellowtail, to some less common ones. The wines come from various regions from South Africa to Portugal, from France to California. Prices seem reasonable. They currently have a discount of 10% for the purchase of any six bottles, and 20% for any twelve bottles. They also have a delivery program but you need to call them for details. They hold weekly free tastings. Every Friday, from 4-7pm, they hold a beer tasting. Every Saturday, from 4-7pm, they hold a wine tasting. As a local wine store, in a town that never had one, this is a good store. Though it is probably not a place that will attract people who live closer to other wine stores. It is small and its selection is probably not diverse enough to make it worth a visit if you have access to other stores. But it is still a relatively new store so things could change in the future. As I very much enjoy Spanish food, I was definitely interested when I heard that this cookbook was finally being translated into English. I ordered a copy and received it recently. So did it meet my expectations? 1080 Recipes ($39.95) edited by Simone Ortega and Ines Ortega (and illustrated by Javier Mariscal) is published by Phaidon Press, Inc. 1080 Recipes is a new hardcover cookbook with 976 pages. It is certainly a thick book and has three bookmark ribbons attached to it. Simone Ortega has been writing about food for over fifty years. 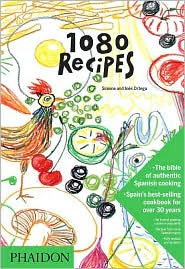 1080 Recipes was first published in Spain over thirty years ago. It is like a Spanish version of The Joy of Cooking, a seminal work in Spanish cooking. Ines is Simone's daughter and is also a food writer. This edition is the first English language version and has been modified slightly to provide some better explanation of special ingredients and cooking techniques. The cookbook is broken down into fifteen chapters including Appetizers; Cold Plate Suggestions; Fried Dishes, Savory Tartlets, Little Turnovers and Mousses; Sauces; Stews and Soups; Rice, Pulses, Potatoes and Pasta; Vegetables and Mushrooms; Eggs, Flans and Souffles; Fish and Shellfish; Meat; Poultry; Game; Variety Meats; Desserts; and Menus from Celebrated Spanish Chefs. It contains over 1080 recipes. These recipes range from easy to difficult complexity though many of the recipes are relatively easy to prepare. Some of the ingredients may be difficult to find though the cookbook does provide a Directory page listing places to find the less common ingredients. Scattered through the cookbook are short sections describing various ingredients and how to prepare them. This includes such items as olive, snails, octopus, legumes, potatoes, asparagus, eggs and much more. This is a nice little addition to the cookbook. Not all of the recipes are specific Spanish foods. Some are just general food recipes, such as hamburgers, minestrone soup, American macaroni and more. A few of the recipes are rather simplistic and it is very strange to see them in a cookbook. For example, Recipe #3, Muffins with Chopped Ham, basically just states to cut a muffin into thirds, spread butter on the muffin and then top with chopped ham. As another example, Recipe #335, Watercress Salad, is just to toss some watercress with a vinaigrette. But there are plenty of interesting recipes as well such as Croquettes, Garlic Soup with Eggs, Paella, Potatoes with Chorizo, Patatas Bravas, Duck & Foie Gras Ravioli, Salt Cod Fritters, Coconut Cakes, and Apple Fritters. Some of the recipes use less usual fish and meat, such as Eels, Pomfret, Hake, Ostrich, Hare, and Partridge. Some also use animal parts which are used less in the U.S., including kidneys, brains, tongue, heart, feet, and trotters. For example, there are six recipes for brains including frittered brains, brains with black butter, and broiled brains with tomato sauce. The basic cookbook has 1080 recipes but there is an extra chapter, Menus from Celebrated Spanish Chefs. This chapter collects contributions from ten different chefs, in Spain and elsewhere. There are over 25 additional recipes, though a fair share of these are of more difficult complexity. There are numerous illustrations throughout the book, though they are rather simple pictures. But there are also some colorful photographs of specific recipes. I am somewhat conflicted about this cookbook. There are some very interesting recipes, especially the more Spanish dishes. But there are also a fair share of recipes that many people would probably never make. I would suggest that anyone interested in this cookbook might want to take a look at it before buying it to make sure it is what you seek. How much do you know about Portuguese wines? Have you tasted many of them? If you know little about such wines and have tasted few of them, then you should have been at this grand Portuguese Wine Tasting with me. What an amazing wine tasting! My prior experience with Portuguese wines has been limited, though I have enjoyed those wines that I have had. So it was a distinct pleasure to have the opportunity to taste dozens of different Portuguese wines. On November 20, I attended the grand Portuguese Wine Tasting at the Harvard Club in Boston. The event was hosted by The Massachusetts Society for the Prevention of Cruelty to Animals (MSPCA)-Angell in partnership with ViniPortugal and the Instituto dos Vinhos do Douro e do Porto (IVDP). There were approximately 150 Portuguese table wines and ports available for tasting. Three similar events were held in other parts of the U.S., including Seattle, Portland and Los Angeles. Dr. Debs over at Good Wine Under $20 attended the Los Angeles event and you can read her review. I very much agree with her comments on the event. While I was at the Boston event, I also had the pleasure to meet another wine writer/blogger, Ken Hoggins of the excellent Ken's Wine Guide and the Boston Wine Buzz. Ken will also be writing about his experiences at this event so be sure to watch for his upcoming post. And for more general information on Portuguese wines, including wine reviews, you should check our Catavino, Ryan and Gabriella's Iberian wine blog. The event was held in a large rectangular room, with the wine tables abutting the four walls. There was a large table of cheeses, fruits, sausage, crackers and bread in the middle of the room. There were also numerous tables and chairs in the room where you could relax during the tasting. It was a nice venue and they made it very comfortable. Attendees received two booklets when they entered the event. The larger booklet contained a list of all the wines at the event, as well as a list of all the US agents for the wines. That would be helpful for trying to locate these wines locally. The booklet also had two pages of general info on Portuguese table wines and Ports. The second booklet was a brief educational introduction to Ports. Before I get into reviews of the specific wines I tasted at the event, I want to make some general observations about the Portuguese wines I tasted. First, there were many Portuguese value wines. Most of the wines cost $20 or less and there were a good share of wines under $10. These were good wines with character and not just some one-dimensional plonk. If these wines cost twice as much as they did, they would still be worth it. So don't be put off by their inexpensive prices. These are quality wines. Second, many of their wines were intriguingly aromatic. I just loved the diverse smells of these wines. Citrus fruit, berries, cherry, herbs, spices, flowers and other exotic aromas that I could not identify but which were pleasing. The smells were prominent, vibrant and alluring. Third, I much preferred the wines that were made solely or predominantly with indigenous Portuguese varietals. I did have a few wines that were predominantly Cabernet Sauvignon and they just did not impress me as much as the indigenous grapes. The indigenous grapes possessed some intriguing smells and tastes that seemed new to me, and they were quite a delight. Fourth, the alcohol levels of these wines generally ranged from 12-14%, probably a lower average than many U.S. wines. None of the wines I tasted had an excess of alcohol. Fifth, most of these wines have a US distributor though there were a couple still seeking representation. So these wines could be available in local wine stores yet it can be difficult to find Portuguese wines. So they definitely need a stronger presence in local wine stores. Are the local distributors pushing Portuguese wines enough? I am sure that if people tried these wines, they would enjoy them. Maybe people should ask for Portuguese wines at their local wine stores. Finally, and most importantly, many of the wine representatives I spoke with definitely had passion about Portugal and their wines. You could readily feel this passion as they spoke of the wines, talking about the varietals, the wine making and more. This passion certainly is enticing, making you more amenable to tasting their wines. It is events like this, with such passionate advocates of their wines, that will help sell Portuguese wines. It certainly made me more of an advocate of their wines. Now, onto the individuals reviews. I should note that I was unable to try all of the wines at this event. There were just too many wines available. I wish there had been more time so I could have tasted more of the wines. I limited myself as well to the table wines and did not taste any of the Ports. But, I still tried a good number of wines and I am going to detail some of my favorites. There were other wines I enjoyed but I just want to highlight some of the better ones. This winery was seeking local distribution for their wines and they definitely have some wines worth buying. These are my two favorites of their portfolio. 2006 Egoista Red: This is from the Alentejo region. It is a blend of Trincadeira, Aragonez (Tempranillo), Syrah and Alicante Bouschet. It has an alcohol content of 13.5% and spent six months in American and French oak. An easy drinking wine with nice cherry flavors and a bit of a spicy finish. 2003 Herdade do Meia Garrafeira: This is from the Alentejo region. It is a blend of Trincadeira, Aragonez, Alicante Bouschet and Castelao. It has an alcohol content of 14% and spent twelve months in French (90%) and American (10%) oak. This is a more full bodied wine with more dark berry flavors and spice on the long finish. It is a complex and well balanced wine. A wine of substance and definitely a good food wine. Quinta da Aveleda is a family winery that dates back to 1947, though the family has been involved in wine making for over 300 years. The winery is located in the heart of the Vinho Verde region though they have some vineyards in other regions too. 2005 Charamba Douro Tinto: This is from the Douro region and "Charamba" is the name of a traditional Portuguese dance from the 19th century. It is a blend of Touriga Nacional, Touriga Francesa, Tinta Roriz and Tinta Barroca. It has an alcohol content of 12% and spent six to nine months in Portuguse oak. This is a fruity, easy drinking red wine with some character to it. There are brief rustic notes and spices on the finish. It only costs $6-7 and is a great value at this price. 2005 Aveleda Follies Touriga Nacional: This is from the Barraida region and is 100% Touriga Nacional from up to 25 year old vines. This is a dark wine with a spicy nose. It is very much an Old World wine, more subtle but with strong dark berry flavors and a moderate finish with nice spicy notes. It has complexity, good structure and would be an excellent food wine. This wine is only about $15 and is another great value. This winery is in the Douro region and was bought in 1983 by its present owner, Jose Arnaldo Coutinho. He replanted much of the vineyards and redid the wine cellar with modern machinery. His first wines were released in 1996. 2000 Reserva Red Wine: This is a blend of Touriga Nacional, Touriga France, Tinta Roriz and Tinta Barroca. It has an alcohol content of 13.5% and spent four months in oak. This is one of their entry wines and only costs about $8. It is a very good wine, with a nice blend of fruit and spice flavors. It has plenty of character and is an excellent value wine for the price. 2001 Tinta Barroca: This is 100% Tinta Barroca and has an alcohol content of 12.7%. It aged for four months in oak. This is another excellent value wine that only costs $10. It has excellent fruit, nice berry flavors. It is a smooth, easy drinking wine. Would be a great wine with many casual foods or you could just drink it on its own. 2001 Touriga Franca: This is 100% Touriga Franca and has an alcohol content of 13.8%. It aged for four months in oak. This wine really impressed me. Lots of lush dark berry and plum flavors. Silky smooth with muted tannins. A lingering finish with a touch of sweet spice. This winery is located in Alenquer, north of Lisbon, in a very traditional wine region. It has been family owned for several generations. They produce many different brands, especially value wines. I would very much agree as I enjoyed most of the wines I tasted in their portfolio. 2006 CSL Fernao Pires: This is from the Estremadura region. It is 100% Fernao Pires and has an alcohol content of 13%. It spent no time in oak. It is a light, crisp white wine with good citrus flavors and a bit of tartness. Would be great with seafood. 2005 Palha-Canas: This is from the Estremadura region. It is a blend of Fernão Pires, Arinto, Vital and a little bit of Chardonnay. It has an alcohol content of 13% and has spent no time in oak. This is a very crisp and fruity white wine. Excellent food wine. 2006 Portuga Rose: This is from the Estremadura region. It is a blend of Castelão and Camarate. It has an alcohol content of 13% and has spent no time in oak. This is an Old World rose, with subtle flavors of strawberry and raspberry. It is crisp and refreshing. Reminded me of a fine French Rose. 2006 Eximus: This is from the Estremadura region. It is a blend of Castelão (Periquita), Tinta Miúda, Camarate and Cabernet Sauvignon. It has an alcohol content of 12% and has spent three to four months in oak. This is one of their entry level reds. It is an intriguing wine with vibrant red fruits and dark spices. A very good value wine. 2005 CSL Touriga Franca: This is from the Estremadura region. This is 100% Touriga Franca. It has an alcohol content of 13% and has spent four to six months in oak. Another delicious wine with subtle dark fruits and lots of intriguing spices, including some cinnamon. Well balanced and complex wine. Dão Sul began in 1989 as a partnership between four men. They began solely producing Dão wines but eventually expanded operations into several other wine regions. They are a large wine company and many of their various wines were represented at the tasting. They were also represented by different distributors who may represent their various estates. 2003 Vinho Tinto Palestra: This wine comes from the Douro region. This was an excellent wine. Great red fruit flavors, lots of character, very smooth and just juicy. And at $8, this is a great value. This was one of my top favorites of the tasting, especially at the price. 2004 Vinho Tinto Cabriz Reserva: This wine comes from the Dao region. It is a blend of Alfrocheiro Preto, Tinta Roriz, and Touriga Nacional. It has an alcohol content of 13.5%. It spends nine months in French oak. This is more an Old World wine with subtle dark fruits. It has some intriguing flavors and a decent finish, especially for a $15 wine. Another very good value. 2004 Vinho Tinto "Quinta das Tecedeiras" Reserva: This is another Douro wine. It is a blend of Touriga Nacional, Tinta Roriz, Touriga Franca, Tinto Cão, Tinta Barroca, and Tinta Amarela. It has an alcohol content of 14% and it spent about ten months in French oak. It uses the same grapes as that to make Port. This is one of their higher end wines, though it still is only $30. This is an intriguing wine with lots of complexity and a great melange of dark berries and spices. It has a lingering and satisfying finish. Even at its price, it still is a good value wine. 2006 Vinho Branco "Grilos": This wine is from the Dao region and "Grilos" means "cricket." It is a blend of 75% Touriga Nacional and 25% Alfrocheiro. It has an alcohol content of 14% and it spent about six months in French oak. This is an aromatic wine with a light red color. It is a silky smooth wine, reminiscent of the feel of a Pinot Noir. It has its own taste though, with vibrant fruit and a spicy finish. This was another one of my favorite wines and it is only $13, making it another exceptional value wine. 2004 Casa de Santar Red Reserva: This wine is from the Dao region and is a blend of Touriga Nacional, Alfrocheiro and Tinta Roriz. It has an alcohol content of 14% and spends 10-12 months in French Oak. An aromatic wine with vibrant dark fruits on the palate. A complex wine with a long finish and mild tannins. 2001 Touriga Nacional: This wine is from the Dao region and is 100% Touriga Nacional. This is an excellent wine that is very smooth and with delicious fruit. There is much complexity in this wine, an intriguing melange of different flavors. There is a satisfying, long finish. This wine sells for around $27 but would sell for twice that price if it were from a different country. If this shows the potential of this varietal, then it truly can be an exceptional grape. 2004 Outono de Santar Late Harvest: This wine is also from the Dao region and it was the only dessert wine I had at this event. Beside the Ports, this was the only dessert wine I saw. It is made from the Encruzado varietal. It has an alcohol content of 13%. It sells for about $25 for a half bottle. This was a very good dessert wine, crisp and sweet though not cloyingly so. Very nice fruit flavors, more tropical. Would go very well with fruit desserts. This winery is located in the Alentejo region. Though the estate was purchased in 1973, the winery was not built until 1987. 2005 Esporao Reserva Branco: This wine is from the Alentejo region. It uses all indigenous varietals and sees a little time in oak. This red wine had good fruit flavors, cherry and raspberry, and a long finish. At $15, this is a good value wine. 2006 Monte Velho Tinto: This wine is also from the Alentejo region. The nose on this wine was so very enticing, with lush berries. Its taste lived up to its smell, lush berries and dark cherry. There were a few dark spice notes. A great wine just to sit around drinking, or paired with a casual meal. At only $8, this is an exceptional value. In 1990, João Portugal Ramos began planting a vineyard in Estremoz and the first harvest was in 1992. The construction of the winery in Estremoz began in 1997. He makes both Old World and New World style wines. 2006 Marques de Borba: This wine is from the Alentejo region. It is a blend of Aragones, Trincadeira and a few others. It has an alcohol content of 14% and sees some time in small oak barrels. This is their flagship wine. It is a fruity, easy drinking wine and only costs about $13. 2006 Vila Santa Trincadeira: This wine is from the Alentejo region. It is 100% Trincadeira and has an alcohol content of 14.5%. It spends six months in new French oak. This wine has dakr fruits and some unusual spice elements which intrigued me. It is a smooth wine and at about $16 is a good buy. 2003 Marques de Borba Reserva: This wine is from the Alentejo region. It is a blend of Trincadeira, Aragones, Alicante Bouschet and Cabernet Sauvignon. It has an alcohol content of 14% and sees a year in small French oak barrels. This is an Old World style wine. It is a powerful, muscular wine with lots of concentration. Strong, dark berries and plums with bits of cocoa and black pepper. Firm tannins and a very long finish. This is a complex and well balanced wine. An exceptional wine. At about $45, this was the most expensive Portuguese wine I tasted and it was well worth its price. Overall, this was an excellent event with so many interesting wines. I very much enjoyed meeting and talking with the winery reps about their wines. And I was glad to see so much passion. Give some Portuguese wines a chance and I bet you will be very surprised by their quality and taste. And as so many of these wines are inexpensive, you could take a chance on their wines very cheaply. If you find some Portuguese wines you enjoy, come back and tell me! It is that time again, to reflect upon our lives and consider everything we should be thankful for during the past year. Though this type of reflection should not be limited to Thanksgiving. We should regularly reflect on our lives and be thankful for what we have. No matter how bad our lives may seem at times, there will always be something of which to be thankful. Seeking the positive may help brighten the darker parts of our lives. I am very thankful for my family, especially my wife, my mom and my nephew Thomas. I look forward to spending the holidays with them, sharing the bounty of the year. I am thankful for my friends, both old and new. This includes my Thursday night wine buddies, my North Shore Winer friends, and the many fellow wine/food bloggers I have met online, and off, during the past year. I am especially thankful at having the opportunity to meet Ryan and Gabriella when I visited Spain. I am thankful for so much. My good health. My job, with my good boss and co-workers. My two cats. My home. My vacation to Spain. I am thankful for my position as a food/wine columnist at the Stoneham Sun. I am thankful for all of my readers, of my blog and newspaper column. I am thankful to the wine community, from the retailers to distributors, from the bloggers to the winemakers. The list could go on and on for all of which I am thankful. But I won't make this much longer of a post. Just make sure that you consider your own lives and be thankful for everything you have. Raise a glass of wine tomorrow in thanks. Enjoy your family and friends. Savor life. And dine with passion! While on Commonwealth Avenue in Boston, I decided to grab a bite to eat and decided on Uni. Located beneath the Eliot Hotel, and next to Clio, Uni is Ken Oringer's sashimi bar. Uni is a small restaurant with a sushi bar and several tables. Their menu has a page of Japanese sake and specialty cocktails. There is a diverse selection of sake, available by the glass, bamboo pitcher, and bottle (small and large). I ordered a bamboo pitcher of the Hakushika Yamananishiki Junmai ($20). This chilled Sake was very good, mellow with pleasing flavors. The food menu has a very interesting and innovative list of choices. Prices generally range from $7-$22. You could also order the Chef's Choice Sashimi Sampler, costing $45, $85, $105 or more. I began with the Anago Tempura ($14), salt water eel with green tea salt and a shirred egg. I received three pieces of eel tempura which were delicious, with a nicely spiced batter. Presentation was very good and the tastes went well together. I just think it was a bit overpriced. Next, I got the Spicy Yellow Fin Tuna Tataki ($20) with seared foie gras, Okinawa purple potato sauce, coconut and pear puree. This dish had four small squares of tuna, a couple topped with the foie and the other two with the pear puree. On the dish were squiggles of a Spanish mustard and the potato sauce. Again, an excellent presentation and the food was very delicious. But, this dish also seemed overpriced. Portions are small. Finally, I got the Steak Teriyaki of Kobe Beef ($22) with kabayaki glaze and Vidalia onion juice. I got a small pile of thinly sliced steak, very tender. The steak tasted very good and on the plate were also three different types of salt along with a dish of the onion juice. Good presentation, excellent food. This cost of this plate seemed a bit more reasonable. Overall, I highly recommend the food. It is innovative and quite delicious. But, portions are often small and prices are high. Maybe best to go on an expense account or on a special occasion when money is not really an object. There is a new lunch option in Stoneham...Georgie D's Place. I have previously told you about the good food that can be found for dinner at Georgie D's Place. Just recently though, they opened for lunch, starting at 11:30am. You have plenty of options, including salads, sandwiches and pasta dishes. Prices are reasonable at an average of $6.95-$8.95. You could order the Mixed Salad, Soup and a Sandwich for $6.95. Your sandwich choices include Cutlet Parmesan, Chicken Parmesan, Grilled Chicken, Meatball and Sausage. Or you could order a Sandwich with French Fries ($6.95-$7.95). Pasta dishes include such items as Chicken Parmesan, Sausage, Meatball, Shrimp Scampi, Steak Pizzeola and more ($6.95-8.95). There are also Caesar Salad and Mixed Salads which you can order with Shrimp, Steak or Chicken. I ordered the Chicken Parmesan Sandwich with French Fries ($7.95). For bread, they use their home-made loaves, which I definitely enjoy. There were plenty of tender chicken cutlets in the sandwich, which were made to order. An excellent and large sandwich. The fries were thick steak fries and there were plenty of them as well. Overall, this was a very good meal and for a very reasonable price. I will be back. And I recommend that you check it out as well. The Malls will be packed this weekend so maybe you should consider something else where not only can you have fun, but where you can shop too. The Spirited Gourmet's new wine store in Belmont is having a Grand Opening party on Saturday, November 24, from 2-8pm. Everyone is invited and there will be wine, food and some special surprises. The store will be roughly one and a half times the size of the Winchester store and will have the same look and feel, as well as similar, but expanded, product offerings. I will probably will attend so maybe I will see you there. Brooklynguy has now posted a lengthy and interesting Round-up of Wine Blogging Wednesday #39. As mentioned before, the theme was Silver Burgundy, wines of the Côte Chalonnaise or Mâconnais region of France. Check it and out and read all of the wine reviews. Brooklynguy has also down an excellent breakdown of the stats of the wines that were reviewed. The theme for Wine Blogging Wednesday #40 has now been announced as well. Sonadora of the Wannabe Wino has announced that Petite Sirah will be the new theme. You just post your review on Wednesday, December 12 and email ctsonadora@gmail.com with a link to your review. If you don't have a blog, email her your tasting notes and she will be happy to publish them on her site and include it in the Round-Up. I look forward to this theme as I do enjoy Petite Sirah. Maybe it will be time to open my Sean Thackery Sirius? My new column of "A Passionate Foodie" can be found in the November 21 issue of the Stoneham Sun newspaper. This is a weekly column that concentrates on reviews of local restaurants though it may also touch on a few other food and wine topics. The new column will be published tomorrow and is currently available online. The new column is a review of Porchai, an interesting Thai restaurant in Wakefield. It is a less expensive option to the Duck Walk. I am a fan of the Bonarda grape, especially the wines made from it in Argentina. Though it is also grown in Italy, I have had only a few Bonards from there and generally I have not been as impressed as those from Argentina. You can read some of my prior reviews of Argentina Bonardas. Last evening, I opened a bottle of 2004 Pulmary Familias Viticultoras Donaria Bonarda ($20) that I got at the Wine Cellars of Silene in Waltham. I note that the winery website is currently under renovation. This Bonarda is an Organic wine, unfiltered and with a 13.5% alcohol content. It is a dark purple wine with a fruity nose, especially a blueberry smell. And it is blueberries that I taste most prominently on my palate as well. There is also a bit of spice and plum on the medium length finish. There are some mild tannins and the wine is well balanced. I drank this wine with some four-cheese tortellini & chicken breast topped by a walnut pesto sauce. It did go well and did not overpower the food. The pesto spices seemed to pair well with the fruit and spice of the wine. I did enjoy this wine and would recommend it as a Drink & Buy. Interestingly enough, Wine Spectator only awarded this wine 76 points. For some people, this rating would cause them not to buy this wine. But I do recommend that you give it a chance! If so, you should check out my friends, Ryan and Gabriella, over at Catavino. They run an excellent wine blog that concentrates on Spanish and Portuguese wines. And there is much going on over there right now. Their latest post, Housekeeping and New Toys!, is worth checking out as it details their latest projects. This includes a monthly PDF that will summarize their monthly themes, the start of a newsletter that will include info not posted on their site, as well as the possibility of purchasing an in-depth book (unavailable in the U.S.) on Sherry. This is the time to start reading Catavino. Tomorrow, November 20, from 5:30-7:30p.m., there will be a grand Portuguese Wine Tasting at the Harvard Club in Boston. There will be approximately 150 Portuguese table wines and ports available for tasting. "Explore the differences among Portos from Vintage to Tawny to LBV to Colheitas. Discover the many varieties of Portuguese Reds and Whites made of grapes indigenous to the Iberian Peninsula including Alvarinho and Tinta Roriz plus many more." This event is being hosted by The Massachusetts Society for the Prevention of Cruelty to Animals (MSPCA)-Angell in partnership with ViniPortugal and the Instituto dos Vinhos do Douro e do Porto (IVDP). It only costs $25 to attend and the money goes to the MSPCA. I will probably attend so maybe I will see you there. One of the new catch words in the wine world is "Biodynamic." Producers may boast that their wines are Biodynamic, as if this makes them better or more special. But what does Biodynamic really mean, and are they really better than other wines? Biodynamic agriculture originated in the ideas of Rudolf Steiner (1861-1925), a writer and philosopher. He spent time investigating the spiritual world and this led to his development of anthroposophy. This philosophy alleges that that spiritual world is accessible through inner development. Using this philosophy as a foundation, Steiner developed biodynamic agriculture. This was detailed in his "Agricultural Course" of 1924. Biodynamic agriculture is considered one of the earliest descriptions of organic farming. It treats a farm as an individual organism, with a unified relationship between the soil, plants, animals, and farmer. Everything needs to be in a proper balance. There is a definite spiritual aspect involved. Though Biodynamics includes organic farming, it goes beyond that. It includes more esoteric items such as using fermented herbal and mineral preparations as compost additives and field sprays. It also relies on using an astronomical calendar, especially the moon phases, to determine the proper times for planting and harvesting. The term Biodynamic is now used as a trademark by the Demeter association, which certifies farms as Biodynamic. Demeter International is an organization of member countries, each with its own Demeter organization. Demeter International has a set of production standards that all their organizations must meet. The original Demeter organization was founded in 1928 and the the U.S. branch was formed in the 1980's. But does Biodynamic agriculture make better wine? That is an area of controversy. Obviously those who practice this form of agriculture believe it works. And there have been a few studies that seem to give some support to them. But there are many opponents who question such studies and claim that Biodynamics does nothing more than what can be accomplished through organic farming. Robert Parker uses Biodynamics in his vineyard in Oregon, which he owns along with his brother-in-law. Jancis Robinson, another leading wine writer, has also supported Biodynamics. I am certainly not qualified to determine whether Biodynamics works or not, though I will state I am skeptical of such claims. The mystical aspect of their agricultural methods does stretch my idea of credibility. I recently read a new article debunking the idea of Biodynamic wine in the latest issue of Skeptical Inquirer (Nov./Dec. 2007). It is an interesting article and if you are interested in the topic you might want to pick up a copy. The article is currently not available on their website though it might be in the future. The article, "Biodynamics in the Wine Bottle" is written by Douglass Smith and Jesus Barquin. Smith has a PhD in philosophy and an Advanced Certificate with Distinction from the Wine & Spirits Education trust. Barquin is director of the Instituto Andaluz Interuniversitario de Criminologia at the University of Granada. In 2006, Barquin was also awarded the Spanish Nationa Prize in Gastronomy for his writings on food and wine. First, the article examines Rudolf Steiner and his writings on Biodynamics. It states that "They are marked by clear falsehoods, disgressions, and odd fantasies." (p.46). And it points out some specifics. One example is that Steiner claims plants are never really diseased. It just appears that way because Moon influences in the soil are too strong. Second, the article moves on to a discussion of the research findings concerning the alleged efficacy of biodynamics. Many of the studies have compared Biodynamics to nonrganic farming. This is not an effective study though as most agree organic practices are better than nonorganic farming. And Biodynamic farming is also organic so it would not be a surprise it does better than nonorganic farming. What would be a better comparison is Biodynamic vs regular organic farming. But few such studies have taken place. There was one such major study, a 21 year old study, that seemed to support Biodynamic over regular organic but the study does have problems. Other such studies have found nothing different between Biodynamics and regular organic. The article ends with asking whether there is any harm to farmers using Biodynamic practices. It concludes that it is a waste of time, effort and money. And that can lead to higher prices for wine, especially if the winemakers can convince the public that Biodynamic wines are better than regular ones. The article does provide a number of references, both books and websites, for the information in the article. I am sure this article is not going to settle the controversy over Biodynamics, but it does add some things to consider. If anything, it points out that further research studies may be needed to prove matters one way or another. So what are your thoughts on Biodynamics? Do you feel there is a difference in taste in Biodynamic wines? If so, what is the difference? And how do you know it is from the Biodynamics and not just the fact they are also organic? I recently visited the newly opened Angela's Coal Fired Pizza and I returned again today for lunch. My meal this time was better than my first visit. Plus, I tried more of the different foods they have available. We began with the Italian Salad ($9) which is made for two people. The salad had Romaine lettuce, including much of the hearts of the Romaine. There were also onions, tomatoes, olives, chickpeas and slices of egg. This dressing was an olive oil vinegarette. All of the ingredients were very fresh and the dressing was tasty. It was good-sized and I enjoyed it. Next, we had a small order of Coal Fired Wings ($8.50). This consisted of about nine chicken wings, topped with coal fired onions and two pieces of Foccacia bread. The wings were excellent, with an intriguing spiced coating and a bit of lemon. The meat was very tender and almost falling off the bone. The onions and bread were very good as well. I definitely could have made a meal of the wings alone. We ended with a small Ultimo pizza ($15.50), one of their specialty pizzas. It is covered with sausage, prosciutto, meatball and pepperoni. This pizza was well covered with meat. There was no shortage of toppings. And it was delicious! The crust was perfect and it was all very tasty. This pizza was much better than the one I had on my previous visit. Service was good. Overall my visit this time was better than my previous one. As it is new, it is probably just working our the kinks. And it has been improving. I will return again and recommend you check it out as well. Say you want to find a new restaurant in Boston. But you don't have much time to decide. You could try to rack your brains about the new restaurant you have heard about. But you may not recall them all. Or you could pour through blogs and message boards. Though that can be time consuming. Or maybe you could check out Where to Eat magazine. Where to Eat is a dining magazine that comes out twice a year: the Spring/Summer issue on May 1 and the Fall/Winter issue on November 1. The Fall/Winter issue has just been published and is available in many bookstores/newstands. There are four versions of this magazines, based on location, including Boston, Cape Cod, Nantucket and Martha's Vineyard. The magazine costs $7.95 per issue. The magazine lists numerous restaurants, providing detailed information including a sample menu. So you can peruse the magazine, seeking suggestions for restaurants and finding all the basic information for that place. The magazine is broken down into chapters, including Catering, Back Bay/Fenway, Beacon Hill, Brookline, Cambridge/Somerville, Downtown, Jamaica Plain/Roslindale, North End/Charlestown, South End, And Beyond, and Destinations. Each geographic chapter begins with a street map of the area, with the restaurants marked. There is then a long list of the restaurants in that neighborhood, with the ones featured in the magazine highlighted. The highlighted restaurants are then detailed. The Destinations chapter lists restaurants in the rest of New England, places worth a drive. A typical restaurant entry is a full page. There is a sample menu, address, telephone number, website URL, Chef name(s), Price Range, Accepted Payment, Hours, Fireplace, Liquor, Services Offered, Dress Code, Parking, and Closest MBTA Station. If you don't see the information you want listed, you can just check the restaurant's website. You won't find any restaurant reviews in the magazine. It is more a reference tool to see which restaurants are available. For reviews, you will have to look elsewhere, places like my blog. I think the magazine is a useful tool. I especially like the maps. If you are going to be in a certain part of Boston, you can check the maps and find a restaurant nearby. You can find a menu that appeals to you. I decided to compare the latest two issues, the Spring/Summer 2007 and the Fall/Winter 2008 issue. I wanted to see whether it was worth having both issues. Was there much change between the two? So, here is a list of the differences and similarities. First, the Fall/Winter issue includes a special supplement that is not in the Spring/Summer. This is "Where to Drink", 64 pages of descriptions of bars and lounges in Boston. It also includes fifty cocktail recipes. This is a nice little extra. Second, the Catering chapter in Spring/Summer has four entries though the Fall/Winter has eight (four new ones). Three, the Back Bay/Fenway chapter in Spring/Summer has 23 entries as does the Fall/Winter though three are different. The menus for the restaurants that are the same though often have some changes in the different issues. Fourth, in all of the subsequent geographic chapters, the Fall/Winter issue has some new restaurants listed, and omits some restaurants from the Spring/Summer issue. There are also additional menu differences in some of the same restaurants. Fifth, the Fall/Winter issue has a column in between each chapter called "Chefs Dish" which is a short Q&A for different chefs. These columns are interesting, giving you a better insight into some local chefs. Sixth, the Fall/Winter issue has a Glossary of food/restaurant terms which can be helpful in deciphering some menus. I would say there are at least 250 terms listed in the glossary. Another helpful tool. Overall I do think there are sufficient differences between the two issues to justify purchasing both. So stop by your local bookstore and check out the latest issue. I think it is a useful tool for foodies. As I mentioned previously, it is now Beaujolais Nouveau time! So I bought a couple bottles of the 2007 Georges Duboeuf Beaujolais-Villages Nouveau ($9.99) at Rapid Liquors in Stoneham. I opened a bottle this evening with dinner, meatballs and pasta. This wine has a vibrant nose of fruity flavors, including a bit of banana. I like that banana flavor and it is one of the reasons I enjoy Beaujolais Nouveau. It is a light-bodied wine, with bright strawberry and banana flavors. It did pair well with my food. It is certainly not a serious wine, but it is enjoyable. It has a tinge of sweetness which should make it more appealing to newcomers to wine who often seek a bit of sweetness in their wines. Interestingly enough, Wine Spectator awarded this wine their highest score, 85 points, for this year's Beaujolais Nouveau. Two other such wines received this same score. For this Georges Duboeuf, they said: "A juicy red, with kirsch and strawberry flavors backed by light spice and sandalwood notes. There's enough structure to match with food. Drink now. 16,000 cases imported." I may try some other Beaujolais Nouveau if I find others over this weekend. As I said in my prior post, the Beaujolais Nouveau is a great gateway wine. It is something that should appeal even to many non-wine drinkers. And it might start those people to trying other wines as well. This Sunday, November 18, the CBS News Sunday Morning will hold their annual food broadcast, anchored by Charles Osgood. It will be live and you can catch it locally on Channel 4 from 9:00–10:30am. I do enjoy watching interesting food/wine programs on TV. I have never seen this particular program before but received a press release about it, and I was intrigued by the content. I think the show will have some interesting segments so I will be checking it out. Someone's in the Kitchen: Cooking schools are all the rage these days. Rita Braver visits the French Culinary Institute in New York City, where enrollment has doubled in five years. Many students, lured by the glamour of becoming a celebrity chef, come face-to-face with the reality of working 12 hour days, five days a week for $30,000 a year. Hot Spots: So, does George Clooney always get the best table? It turns out that -- from Michael’s and The Four Seasons in New York to Spago in Los Angeles -- there’s a pecking order, even among “A” list eateries. Correspondent Tracy Smith finds out how to get the best table. Take Five: Correspondent Seth Doane visits the set of the upcoming movie “Ghost Town” starring, among others, actor Greg Kinnear, to find out just what goes into creating the perfect meal break on the set of a Hollywood film. It's a safe guess that it's not exactly like the way the rest of us grab lunch. The Spice of Life: Martha Teichner takes a look at the spices we’ll be using this holiday season and uncovers a rich history. From ancient Roman recipes to Columbus’ journey to America in search of pepper, spices have fueled global exploration and world trade. How Sweet It Is: Did you know that the artificial sweetener saccharine was discovered by accident? Americans have long been on a quest to satisfy their sweet tooth without expanding their waistlines, but are these sweet promises a myth? Correspondent Joie Chen goes in search of answers to that age-old question – can we have our cake and eat it, too? Fast Food: For thousands of years, fasting has been a ritual part of many religions and cultures. But as Serena Altschul discovers, these days fasting is also big business. At the southern California spa she visits, you can pay up to four thousand dollars a week to eat nothing – a lot of dough when there’s no bread involved. Cornucopia: It's the season when corn commonly adorns many festive decorations. But corn plays a much larger role in our everyday lives. From high fructose corn syrup to animal feed, corn is a dominating, and sometimes unhealthy, ingredient in many of the foods we eat. San Francisco-based Correspondent John Blackstone has the story. A Frank Discussion: Bill Geist enrolls in Milwaukee’s Hot Dog University – yes, it is real. Along with his fellow students, Bill learns the tricks of the trade and gets hands-on, behind-the-cart field training. Does Bill have the dogged determination needed to make it in the world of fast food? In addition, Sunday Morning's Russ Mitchell visits restaurants serving only desserts. Chef Bobby Flay pays tribute to the lowly oyster. And from Washington, Correspondent Bill Plante joins the furious debate over the perfect stopper for a bottle of wine. Could the lowly screw cap be better than a classic cork? Throughout the broadcast, viewers will also be able to log on to CBSNEWS.com for a variety of holiday recipes. Last night, I led a group of of the North Shore Winers to a Holiday Wine Tasting at Corporate Wines in Woburn. There were about 56 wines available for tasting. I did not try all of the wines but the following are the ones I enjoyed the most of those I did taste. There were probably other good wines too, but I could not taste everything there. 2006 Victor Hugo Viognier, Paso Robles, California ($21.25)--I very much like the wines of this producer. Though I am not a fan of Viognier, this wine would definitely appeal to those that do. 2002 Changala Cabernet Sauvignon, Paso Robles, California ($18.25)--Lots of bright cherry flavors. 2005 Mont Olivet Chateauneuf Pape, France ($33.25)--Exceptional wine. Muscular, powerful wine with good berry flavors. 2005 Graciano Rosso Montepulciano, Italy ($12.25)--Excellent value wine, like a baby Brunello. 2003 Trentadue La Storia Cuvee 32, California ($34.25)--A Super Tuscan blend. Good blend of berries and spice. 2003 Dom Martinho Vinho Regional Alentejano, Portugal ($14)--Dark, smoky wine. Blend of Aragones (Tempranillo), Cabernet Sauvignon and Syrah. 2004 Dry Creek The Mariner, California ($44.25)--Bordeaux-style blend. Smooth, spicy, good fruit. Lots of complexity, well balanced. Remember back to about a year ago, to Thanksgiving of 2006. Do you remember what specific wines you had with dinner? I am sure that most people won't remember, except maybe that they had a Pinot Noir or a Riesling. They are unlikely to remember the producer or much else about the wine. What you are more likely to remember is the good (at least hopefully it was good) time you had, the family and friends that shared your table. You might remember whether the food and wine was good or bad. But the specifics may be foggy. There are plenty of magazines, newspapers and online articles that provide wine recommendations for Thanksgiving. If you read several of them, you may realize that they present quite a diverse choice of recommendations. There are few types of wine that someone does not recommend. I could do the same here, provide more such recommendations. But do you really need that? Anyways, who will remember the wines next year? We must also remember that a wine shared with good friends and family is likely to taste better, or at least seem that way, than one drank alone. The circumstances of the day, the good feelings, the fond memories, the thanks for the past year, will all lead to your wine seeming better. And it is all those circumstances that people will most remember about Thanksgiving. I will probably bring a case of wine to my Thanksgiving feast, a mix of sparkling wine, white, red and dessert wine. In general, I will pick interesting and delicious wines that I feel people will enjoy. I won't spend much time worrying about pairing them with specific dishes and foods. Today is another Wine Blogging Wednesday, the 39th edition of this blogger tradition. Started by Lenndevours, Wine Blogging Wednesday is a day when many wine bloggers all drink wines based on a shared theme. Then, each blogger posts a wine review and links them to the central site. This month's theme was chosen by Brooklynguy and it was Silver Burgundy, wines of the Côte Chalonnaise or Mâconnais region of France. These are usually less expensive Burgundian wines and Brooklynguy had a nice description of the regions and their wines. I was unable to participate in this month's event but I do recommend that you check out the reviews from all of the participating wine bloggers. You are likely to learn of some inexpensive but excellent wines. It is Fall in Boston and temperatures are falling. Winter will soon be here bringing snow and much colder weather. So it is time for heartier foods, something to take away the chill. It is a time for chowders and stews, roast turkeys and ducks. I think it might also be the season for spicier foods, maybe some southwestern cuisine. If so, then maybe this cookbook will satisfy you. 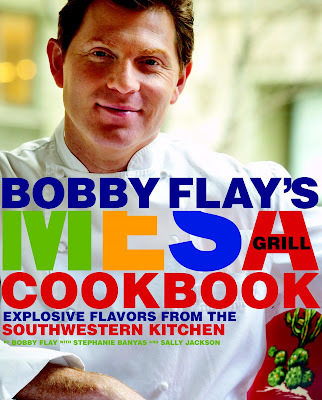 Bobby Flay's Mesa Grill Cookbook ($35.00) by Bobby Flay (with Stephanie Banyas and Sally Jackson) is published by Clarkson Potter/Publishers, an imprint of the Crown Publishing Group, a division of Random House. Mesa Grill is a new hardcover cookbook with 278 pages. The primary author, Bobby Flay, is certainly well known. His face can often be seen on TV, especially the Food Channel in shows such as the Iron Chef. Flay opened his first restaurant, the Mesa Grill, in 1991 in New York City. It specialized in innovative Southwestern cuisine. Since then, Flay opened outposts of the Mesa Grill in other cities as well as opening a few other, different restaurants. He has also authored six other books. In Mesa Grill, Flay provides recipes from his restaurant, from what he calls 'contemporary Southwestern' cuisine. Yet he provides more than just recipes. He also provides a foundation for this cuisine, the ingredients and techniques you need for the recipes. This makes the cookbook more accessible and easier to use. The cookbook begins with five pages describing the various ingredients of Southwestern cuisine, from avocadoes to tortillas. There are then three pages on chile peppers. Finally, there are three pages of cooking techniques, such as roasting corn, cold-smoking and making chile puree. All in all, some excellent basics. The rest of cookbook is broken down into eleven chapters including Drinks, Soups, Salads, Appetizers, Shellfish & Fish, Polutry, Meat & Game, Sides, Relishes Sauces & Vinaigrettes, Desserts and Brunch. It contains about 150 recipes. Generally these recipes are of easy to moderate complexity to prepare. Most of the ingredients should be readily available in large grocery stores. The book does provide a Resources page listing where some of the less common ingredients can be found. The Drinks chapter begins with a short summary of the various types of tequila and then lists four margaritas and a couple other cocktails. The Cactus Pear Margarita sounds intriguing, though you probably would have to order the Cactus Pear juice online. As winter is soup/chowder season, the Soups chapter has a couple interesting choices, including the Pumpkin Soup with Cinnamon Crema and Roasted Pumpkin Seeds as well as the Sweet Potato and Roasted Plantain Soup with Smoked Chile Crema and Fried Plantain. For Appetizers, I would like to try the Queso Fundido with Roasted Poblano Vinaigrette, BBQ-Duck Filled Blue Corn Pancakes with Habanero Sauce, and Mussels in Red Chile Pesto Broth. All sound like good Winter dishes. The entrees that intrigue me include: Smoked Shrimp Cakes, Blue Corn Crab Cakes, Artic Char and Mussels in Green Garlic Broth, Pan-Seared Duck Breast with Red Chile-Pear Sauce, New Mexican Rubbed Pork Tenderloin with Bourbon-Ancho Sauce, and the Lamb and Goat Cheese Enchiladas. The Sides chapter has a delicious sounding Sweet Potato Gratin (with accompanying photo), Creamy Polenta with Cortija, Roasted Garlic Tamales with Thyme Butter, Sweet Potato Tamales with Pecan Butter. The Sauces chapter is extensive with salsa, chile sauces and other hot sauces. Even the Desserts chapter is very appealing with items such as the Chocolate-Coconut Bread Pudding, and Caramel Apple Shortcakes with Apple Cider Reduction.